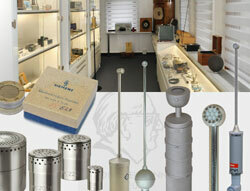 The Microtech Gefell GmbH is a Thuringian traditional company with experience in the handmade manufacture of acoustic measurement microphones since 1937. 1928 Georg Neumann and Erich Rickmann established the limited partnership Georg Neumann & Co. The main idea lies in manufacturing microphones following the capacitive transducer concept. An aim they managed to achieve for the first time in serial production with the condenser microphone CMV 3. 1943 - To avoid further bombings, the entire company and the principal laboratory has been transferred to Gefell. 1950- 2017 - Georg Neumann & Co., now Microtech Gefell GmbH /MTG increases its activities in the field of acoustic measurement technology, based on its traditions dating from the 1930s. This is a slogan which is impressively reflected in the exhibition of historical and modern acoustic measurement technology in the MTG company museum, ceremoniously opened in 2012. Historical exhibits, drawings, publications, photographs and documents give insight into the background of acoustic measurement technology, as well as an overview of its development in the past and present. A significant part of the exhibition is composed of historic measurement microphones and measurement systems including such rarities from the 50s as the 1” capsules MK 101, MK 102 (MK 630), 1/2” capsules MK 201 (MK 650), measurement microphone preamplifier MV 630, the MV 101 tube or MV 102 FET. Moreover there are contemporary documents about the history of the first Gefell measurement microphone in space that was to be used during the mission aboard the Soviet space station Salyut 6 by Sigmund Jähn - Germany's first astronaut, in 1978. Using the precision impulse sound level meter 00024, equipped with the 1/2 inch measurement microphone preamplifier MV 202 and the capsule MK 202 noise measurements were performed in the orbital station Salyut 6. Today, after a successful history of 80 years MTG designs, manufactures and supplies worldwide a growing range of measurement microphones and acoustic measuring systems. The condenser measurement microphones are used for a wide range of acoustic measurements, e.g. of aircraft, Wind turbines environmental, traffic noise/ car acoustics, automotive production process, machinery noise, et al.